In my 2015 review of Krisha, Trey Edwards Shults feature writing and directing debut, I opened by saying the film, “has a lot of interesting ideas going for it, but one begins to doubt its ability to bring them all together as it races towards its final minutes and seriously begs the question of what exactly everything is building to.” In many ways (and maybe unsurprisingly), one could say the same thing about his follow-up, It Comes at Night. Strangely enough, the dynamics and questions pondered in that initial feature prove to be more interesting and compelling than what feels like an extension of many of those same themes in this new film. In short, It Comes at Night serves up the leftovers from Krisha in that the ideas here still have to deal with family, the potential toxicity of family, and dealing with the inherent connections we’re all born into while questioning how loyal we must remain when things get worse for wear. Of course, all of this is conveyed in what is meant to be taken as a post-apocalyptic setting where tensions are already high and relationships already strained. Things are heightened; this isn’t simply a familial drama about an argument that arises between two opposing members, but more It Comes at Night writes a metaphor for how to handle the small, awkward moments we all encounter when we’re a part of something bigger. It’s a film about figuring out which fights are worth picking and which are worth leaving alone with the outlier of such risks being the fact one of these calls could come back to bite you. This is all really fertile ground to dig into especially when taken through the aforementioned guise of the horror genre, but unfortunately Shults still doesn’t seem to have as strong a grasp on communicating his themes as he does in crafting them. The kid is already a master of atmosphere as some of his film’s strongest qualities come from Brian McOmber’s intense score and Drew Daniels haunting cinematography as they capture the otherwise quaint scenario Shults has set-up, but where It Comes at Night succeeds in building atmosphere and placing conversation-starters on the tip of its audiences' tongues it fails to actually engage that audience in the moment. To this effect, It Comes at Night is one of those films that is fascinating to contemplate and discuss moments after experiencing it, but in the midst of that experience it couldn’t feel more tedious. 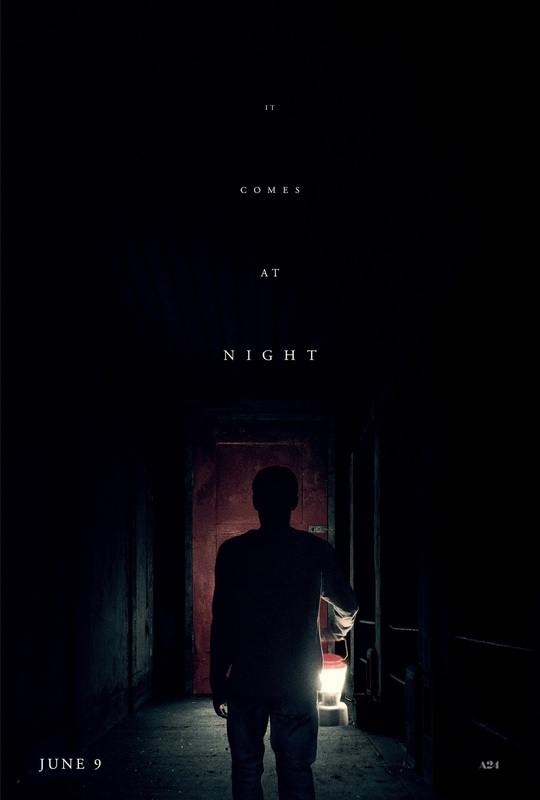 To reiterate in some sense, It Comes at Night is also one of those films that wants you to think it's smart even if it’s not going to provide solid reasoning as to why you should think that. 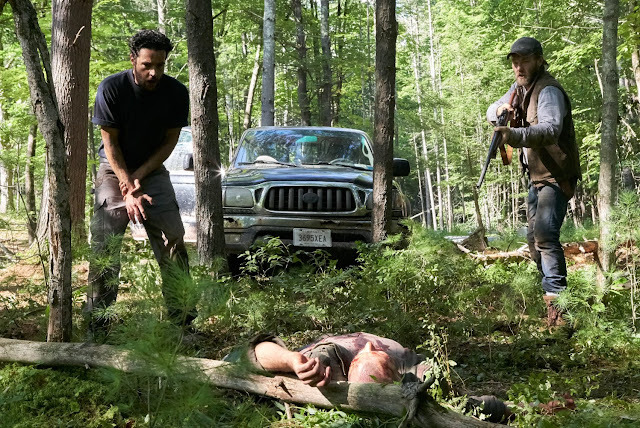 In the case of this particular film that means that while we are given little more to go off other than the fact that a family of three including father Paul (Joel Edgerton), mother Sarah (Carmen Ejogo), and their seventeen-year-old son Travis (Kelvin Harrison Jr.) are holed up in a house in the woods trying to evade whatever sickness is obviously spreading through the cities we are expected to take away more than these basics. We're meant to see pain. We're meant to elicit the loneliness. The thing is, Shults leaves his story so open-ended in almost every facet that each individual viewer’s interpretations of the events could be so wildly different that it almost forces me to draw the conclusion that what Shults is actually talking about is nothing at all. That he, by making the viewers do the majority of the heavy lifting, has done very little himself. Is that really the intent of the writer/director? Probably not as I would imagine someone who sets out to make a feature film on a shoestring budget with his family serving primarily as the cast and their home as the single location at the age of twenty-five isn’t exactly someone you’d label lazy, but while this leads me to believe there is real ambition and vision contained within the red door so prominently featured in It Comes at Night it also leads me to believe that this director and his film couldn’t crack how to funnel these topics they wanted to talk about down into a meaningful and moving piece of filmmaking. It is abundantly clear that Shults draws much of his inspiration from family turmoil and the interesting ways in which such invisible bonds bind us together, but come the final fifteen minutes of the film it ultimately seems that only small morsels of what Shults had fed us up to that point even tend to matter. In turn, Shults and his collaborators stage what is easily the most intense of the sequences to be featured in the film as it culminates in actions that are meant to be gripping, but are instead rather irritating due to the fact they feel unearned. Will (Christopher Abbot) and Paul (Joel Edgerton) protect their families in It Comes at Night. Coming out of the film it was next to impossible to not feel torn over the ambition versus the execution. And yet, while it is easy to acknowledge the craft, care, and maybe most importantly-the confidence-that it takes to deliver as restrained a picture as It Comes at Night, there is an inevitably empty feeling left by the film itself. The dread and tension of the unknown are certainly kept at a high, but they are outweighed by that irritating confusion and lack of any real investment in this group of people. There is such a thing as giving an audience too little despite the fact you think you’re giving them a lot to chew on and this is the line Shults is going to have to learn to more evenly walk as he develops as an auteur. This also isn't to come down on the film completely as its intentions are certainly notable and taken into consideration when evaluating the film as a whole. And the lack of investment in the character's is no fault of the actors necessarily as Edgerton, Ejogo, and Harrison Jr. do their best with the material given-I especially found Edgerton and Harrison Jr.'s showings to be measured in the way Shults might have imagined them to be when he penned the screenplay-while the introduction of Will (Christopher Abbot), his wife Kim (Riley Keough), and their young son Andrew (Griffin Robert Faulkner) into the fold create opportunities for new dynamics to be established and for much of the films drama to be drawn from. While the focus remains largely on Harrison Jr.'s Travis and his conflicted feelings about how his father runs the family domain, a budding lust for the attractive Kim, as well as realizing he could certainly end up alone with only his dog, Stanley, and any future spawn of Will and Kim it is the limited interactions between the people on screen that leave the biggest impressions as well as elicit the most questions. We come to wonder what it is all worth; if the price we must pay is worth surviving one more day? There are lingering questions even after the credits have long since disappeared from the screen, introspective ones even, and yet as I sat and considered what Shults was attempting to say, what statement he might think he was making, or what audience members were supposed to take away from such an exercise I couldn't help but be assured by such potential while being simultaneously let down by the capacity to capitalize on that potential. This is one to be further assessed once it sinks in and earns a second viewing.